Credit conditions may be tight, but this book should increase your chances of securing a bank loan for your business. It starts by supplying some background on banking and on showing you the different kinds of banks; how they operate and what kind of loans they offer. It also covers some of the government loan initiatives in the US, Canada and the UK. To even stand a chance of getting a loan, you will need to prepare yourself in advance. This book will draw your attention to some of the preparations you will need to take before approaching your banker. It also suggests that preparing a business plan could greatly assist you in securing a loan. You’ll get a tour behind your banker’s desk and get a view of what is seen from the other side. You will be shown how to finance your accounts receivable from factors. You will also learn how to finance exports and imports. Finally, this book tries to put into context, the whole financial mess that we have just endured and how attempts are being made to bring the big banks back to heel. Hopefully, these government and regulatory actions will create a more sane environment in which small businesses can get better access to loan financing in the future. This book should definitely be on your reading list before you go charging into you bank in search of a business loan. 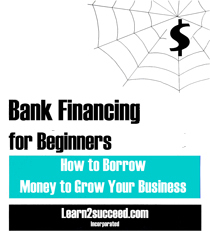 Bank Financing for Beginners: How to Borrow Money to Grow Your Business by: Learn2succeed.com Incorporated: Softcover; 114 pages; ISBN: 978-1-55270-459-2 published in 2012; $19.99.